A couple of days ago, we featured the unveiling of Samsung and LG on their 105-inch curved TV set. And now another TV announced, it's the world’s largest Ultra HD TV with 110-inch(3840 x 2160) by the South Korean TV makers-Samsung. This gigantic 110-inch UHDTV sports a resolution of 3840 x 2160 pixels, which is four times as many pixels as a 1080p HDTV display. 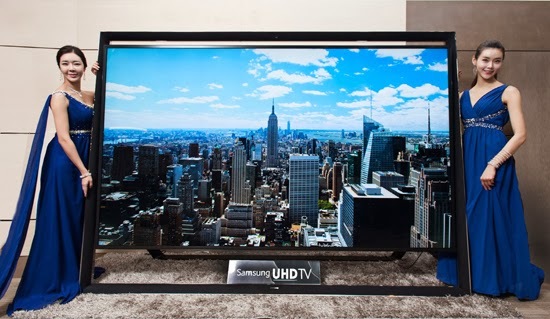 This is the bigger brother of the previous 85-inch UHDTV by the same manufacturer. Samsung’s 110-inch Ultra HD TV is now sale in China, the Middle East, and a few European countries but there’s no word on price yet.